A native of Bavaria, Charles Kiefe initially settled in Philadelphia. He moved to Wilmington in about 1862 and opened the Crystal Saloon and restaurant in the basement of the Saville Building at 501 W. 6th Street, near Market. The next year he moved over to 4 W. 3rd Street in the Glazier Building, where he operated an ale vault and restaurant. In 1868, Kiefe entered the brewing business, opening a small brewery on Girard, near Orange Street. In later years, the Wilmington News Journal Building constructed its main office building upon the same site. Kiefe also maintained an office and saloon at 311 Market Street. 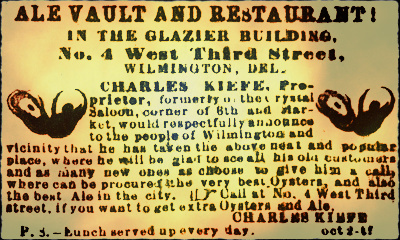 The brewery didn’t last long and Kiefe returned to Philadelphia by 1870, opening a restaurant there. Andrew J. Wilhelm stepped in to operate Kiefe’s brewery in 1870. Two years later, he opened a saloon on 411 Shipley Street, which also served as the primary dispensary depot for his beer. The saloon was a popular spot among Wilmington’s German community and even served as the meeting location for the German Library Association from 1873 until 1880. Unfortunately, Wilhelm’s brewery business was not as successful as his saloon. He shuttered the Girard Street brewery for good in 1874 but continued in the saloon trade.